Rugby’s Irish Women & Men Make It An Irish Weekend Of Glory! It’s been a fantastic week in Irish rugby! Yay! First up on Saturday we had the Irish mens’ rugby team doing the business after beating Scotland 40-10 in Murrayfield after Wales bet Italy comfortably 61-20 in Rome earlier in the day and England narrowly missed out on winning the title after beating France 55-35 in an amazing, thrilling match at Tichenham. They needed to win by 26 clear points so Ireland retained their title on points difference. 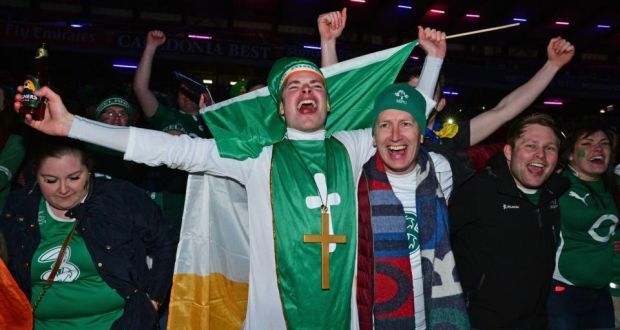 The lovely people at Murrayfield let fans back in to witness Ireland lift the trophy. Next up was the Irish womens’ rugby team who won both the Triple Crown and championship after beating Scotland 73-3. France’s win over Italy last weekend which gave Ireland the chance to secure complete top honours at the Broadwood Stadium today. Ireland repeated their feat which they already secured in 2013 after a win against Italy 6-3 that year. Congrats to both and all concerned! Great weekend for us in Irish rugby. Very proud.